SurfGuitar101.com is now secure for your protection! 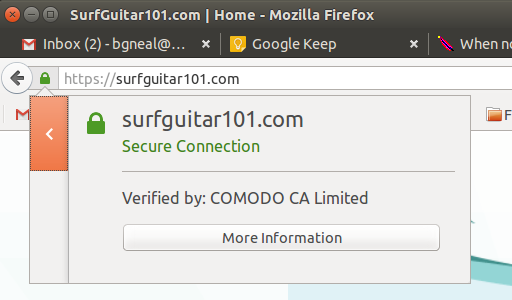 It has been a very long time coming, but today I am overjoyed to announce that SurfGuitar101.com is now running on a secure https connection. I'm really sorry it took so long to get here, but there were nearly 10 years of hot-linked images in the forums that had to be dealt with. It would be unthinkable to just discard them, so a script was developed to copy all these thousands of images into cloud storage, then rewrite all forum and comment posts to use the new secure image locations. I then had to develop a way to let users either upload images to our cloud storage, or copy hot-linked images there. There were lots of other little details to attend to also. But it's finished and I'm going to grab a beer! SG101 cares about your privacy and security! We may have missed a few pages, so if you see browser warnings about non-secure pages or so-called "mixed content" issues, please send me a link to the page as soon as possible! The Surf Guitar 101 2015 Convention will have t-shirts! A Denver based company called ilaughoutloud is bringing a limited number of these, so be sure to purchase early. Shirts are available in a range of adult shirt sizes and will be $20 each. Proceeds of shirt sales help fund the convention! Contact GINNY at imagesinthewind@gmail.com to pre-order and pre-pay with PayPal to be sure your size is available. While supplies last, shirts will be made available three days: Friday night a the Purple Orchid, Saturday at the Convention, and Sunday at the HB Pier Surf show. Pre-order or contact Ginny to let her know you're interested so she can bring enough!